Change is not always bad. I don’t hate progress. That being said, it seems like every time Social Media giants like Facebook and Instagram make a change, it’s a change for the worse. Often, it’s just a plain ol’ money grab, like increasing the frequency of ADVERTISEMENTS — built right into your feed, masquerading as pertinent content from your friends — to a ludicrous, basically unbearable amount. Other times, it’s adjusting algorithms that screw up what you see, for no apparent reason. 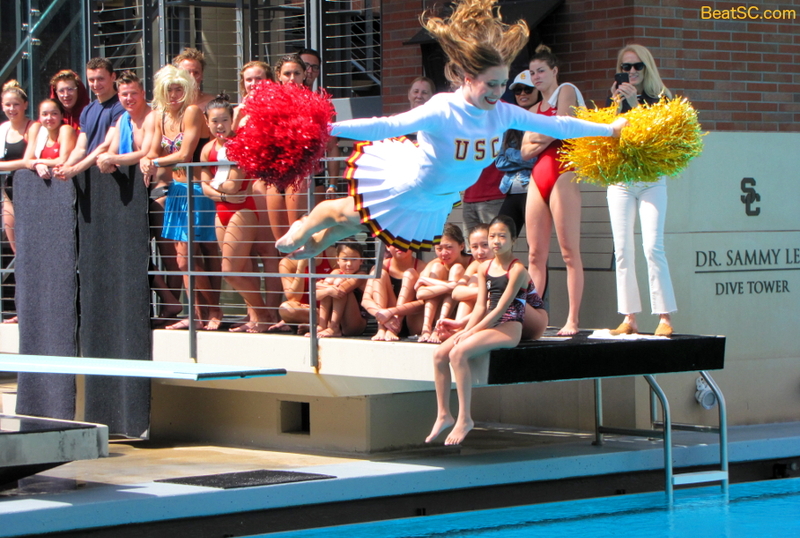 As the Post-Alford Era of UCLA Basketball dawns, the USC Song Girls don bikinis for the final time this year in the following array of photos from the Swim With Mike fundraiser held last Saturday. UCLA introduced new Head Basketball Coach Mick Cronin today, and it appears that the program is in good hands. The choice of Cronin checks all the right boxes: He does not have a sleazy past (like Calipari), he is known for tough teams that play tenacious D (unlike his predecessor), and he seems to have great respect for UCLA and the John Wooden Tradition. I actually got to speak to Coach Cronin privately for about 5-10 minutes, and I am convinced that he understands our Rivalry with usc. I told him that beating sc isn’t a matter of life and death, it’s much more important than that. He told me that HE GETS IT, telling me about Cinci’s rivalry with Xavier. I told him we don’t hang Final Four banners here, but you have to win the CITY Title first. Then we talked about winning THE RIGHT WAY, without getting your hands dirty. I told him I was so happy to have HIM instead of someone like Calipari, who has been caught breaking the rules on multiple occasions. Cronin told me that THIS IS UCLA, and we don’t NEED to break the rules in order to attract top talent and win Championships. Also, he’s not going to take any crap from his players. If THEY break the rules, they won’t play. Did McDonald’s finally add a croissant-donut hybrid, or did UCLA hire a new Head Basketball Coach? 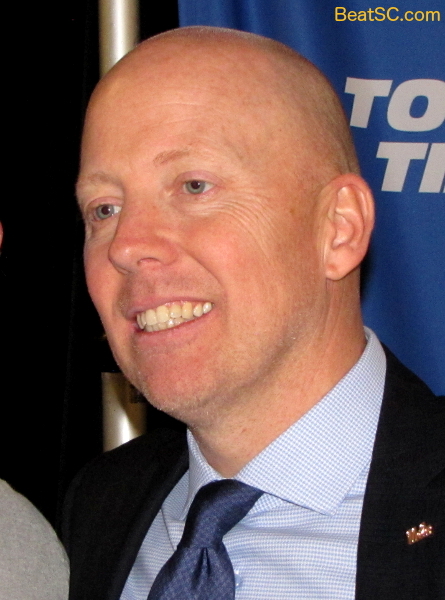 In general, I like Mick Cronin. His Bearcat teams have looked great — at least against UCLA — in the last couple of years, and are known for tenacious defense, which is exactly what has been missing in Westwood for the half-decade since Ben Howland was removed from his post. Also on the plus side: He is not John Calipari, Rick Pitino, Larry Brown, Kelvin Sampson, or Bruce Pearl — all potential candidates with DIRTY hands and/or sleazy pasts. And, Cronin is not Earl Watson. As much as I may appreciate that Watson is a great Bruin, I do not want someone who has never Coached or recruited at this level. So Cronin has won at this level, gotten his team in the Top 25, reached the Tournament every year for almost a decade, and is only 47 years old. These are all pretty much “prerequisites” in my opinion. But… there is still lots of downside to this choice: He’s not one of the top choices of the search committee — more like the 8th. And worse, he has never gone far in the NCAA Tournament. He has gotten to the Sweet 16 only once, and never any further. His last two teams have gotten eliminated after blowing huge leads — not a good sign that a Coach can coax clutch performances when it really matters. However — I am not upset with the choice, and I am not convinced that he is doomed to fail. If he can recruit better than he did while a mid-major, then he can get something done at UCLA. If he can get 4-star players to commit to Defense, he could easily build the next UVA, right here in L.A. 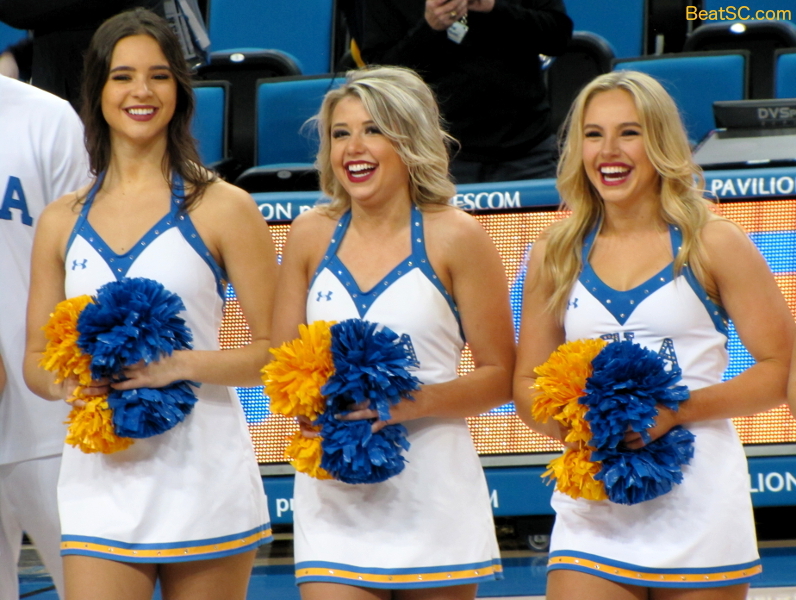 Speaking of L.A., here are 69 more shots of cheerleaders from that other school in L.A…. To beat a school of thugs who often don’t pass go but DO collect $200 before going directly to jail, UCLA had to roll the dice and put that Bruin Race Car into overdrive. u$c played an AMAZING game, overcoming two crucial injuries, dishing out 28 Assists to only THREE Turnovers, and MAKING NINETEEN THREE POINTERS, yet it wasn’t enough to stop the hungry Bruins from avenging a 13-point loss to troy earlier in the season. It was a see-saw battle all the way, with double-digit lead changes and several one-sided spurts. Sc led by 10 early, but UCLA led by 9 later. Troy’s Bennie Boatwright was unstoppable, sinking 7 three-pointers and grabbing a career-high 15 Rebounds, falling only 4 Assists short of notching what would have been only the second triple-double in sc history. Jonah Mathews added 5 treys of his own, as UCLA’s zone was pathetic against outside shooting. Hands stands alone. 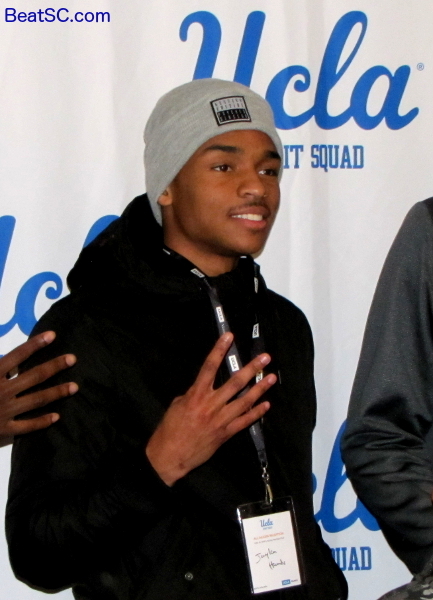 UCLA’s Jaylen Hands just had the half of a lifetime. After getting completely blanked by Oregon in the first half and watching the Bruins trail by 16 at the intermission, Hands jobbed the Ducks in the second half, scoring 27 — the most by a Bruin in one half in God knows how long — to lead UCLA all the way back to jerk the game away from Oregon in a 90-83 victory. Hands hit 7 three’s in the half, including the dagger in the final minute. The Bruins scored 17 straight points in the second half, in a spurt reminiscent of the Wooden Glory Days. Hands was dominant, making NBA-distance treys, while Kris Wilkes and Jules Bernard also filled it up. Alex Olesinski and Jalen Hill were also on the floor contributing with Defense and Rebounding as the Bruins went on their remarkable run. 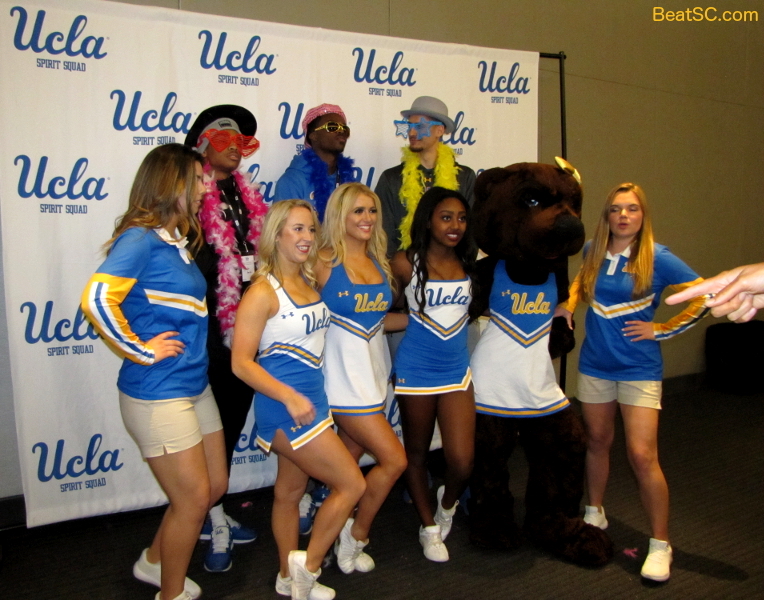 It may have been a coincidence that the 2019 UCLA Spirit Squad All-Access Reception fell on the same day as the 2019 Grammy telecast, but there were definite parallels: Good music, Star Power, Girl Power, diversity, celebration, and fans going Gaga. The annual UCLA Cheerleader fundraiser included a silent auction, an opportunity drawing, and visits from several Bruin athletes. 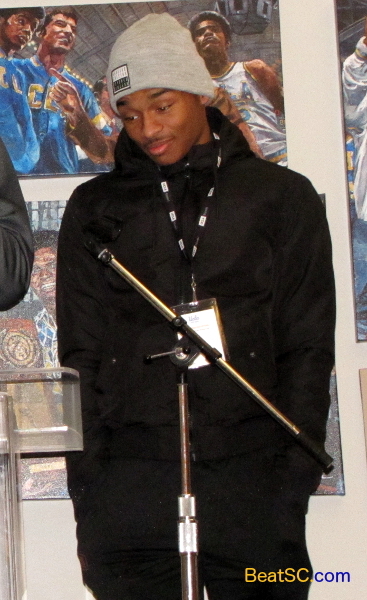 A Chip Kelly autographed football, Under Armour swag baskets, and luxurious vacation excursions were among the prizes available to donors of the Program, and honored guests on hand included members of the Mens Water Polo team, Footballers Dorian Thompson-Robinson and Delon Hurt, and Basketballers Kris Wilkes, Alex Olesinski, Jaylen Hands, and Chris Smith, one of whom, at the bar, dropped a glass which crashed loudly on the ground — kind of symbolic of their struggles with Turnovers this season. Like most everyone outside of Boston, I am tired of Tom Brady and Bill Belichick teaming up to win Super Bowl Championships. But I never get tired of ex-trojans losing big games, and Bruins earning Rings, and that’s what happened on Sunday, when the Brady/Belichick Dynasty added another Title to their legacy, with New England’s 13-3 victory over the Rams. The Patriots outplayed the Rams on Offense, Defense, and Special Teams, but the score was still 3-3 in the 4th Quarter, when Brady engineered the game’s only TD drive. After an ensuing Jared Goff Interception, the Pats added a Field Goal to make it 13-3 with about a minute left, basically icing the game. The Rams’ Offense, “led” by ex-trojan Wide Receiver Robert Woods, set Super Bowl records for futility, including 8 straight drives ending in a Punt. Woods was targeted 10 times, but 5 of those were failures, including an early DROP by Woods.